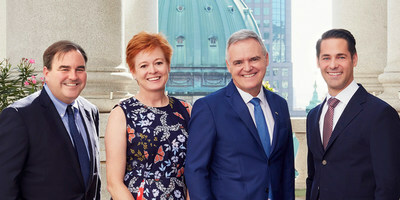 MONTREAL and LONDON, April 3, 2019 /CNW/ - AVENIR GLOBAL, a Montreal-based holding and management company of public relations and communications firms, today announced that it has acquired Hanover, a top 10 independent U.K. public relations consultancy with offices in London, Brussels, Dublin, Dubai and Abu Dhabi. This transaction is part of a strategic plan to build a global powerhouse of specialist communications firms delivering outstanding value to clients. Together with the November 2018 acquisition of London-based healthcare creative agency, Cherry, the deal significantly enhances AVENIR GLOBAL's EMEA offering. The group was already represented in the region by healthcare communications firm AXON Communications, with offices in London, Copenhagen, Zug, Brighton, New York and Toronto, and by its strategic communications consultancy Madano Partnership. "We are building a powerful network of colleagues who are the best in their field and our goal is to provide our clients with bold thinking founded on research, insights and deep sector expertise. Hanover is hugely respected as one of the best and fastest growing agencies in the world and this transaction showcases our ambitions. In addition to an enhanced geographic footprint, there is a strong cultural alignment, which is critical to our teams working well together," said Ralph Sutton, International Managing Partner of AVENIR GLOBAL. "Hanover focuses on communications and public affairs disciplines which are key to our network, in addition to deep sectoral expertise in healthcare, financial services, technology, media, energy, fast-moving consumer goods, industrials and sport. The combined business in the U.K. places us among the country's largest public relations consultancies; second in public affairs and first in healthcare." Founded in London in 1998 by CEO Charles Lewington, Hanover is one of Europe's leading strategic communications and public affairs consultancies with 163 employees, advising global companies on building recognition and enhancing reputation. Clients include Goldman Sachs, Airbus, Microsoft, Apple, Warner Media, Sky, Lucozade Ribena Suntory, Premier League, Tata Steel, Lilly, Novartis, BMS, Roche and Takeda. The Hanover Group also includes creative communications agency The Playbook, and Multiple, a brand and culture consultancy that enables technology challengers and corporate change-makers to define their purpose, fire up their people and build platforms for growth. The agency's leadership team will remain in place following the transaction. "AVENIR GLOBAL provided a strong business case for joining forces to create an unrivalled worldwide team of specialist communications firms. We share a common belief in building a high degree of client service and expertise," said Charles Lewington. "By joining the AVENIR GLOBAL network, we broaden our offering in insights and research, add impressive resources in creative and digital campaigning and execution, and can draw on additional scientific expertise in healthcare, food and drink, and energy. Our international clients also now have access to a strong presence in North America which will help us meet their international communications objectives." In Canada, AVENIR GLOBAL owns NATIONAL Public Relations, the country's leading public relations firm, servicing clients across a wide range of sectors, which includes NATIONAL Capital Markets, the industry's foremost investor relations and financial services practice. In the United States, AVENIR GLOBAL owns SHIFT Communications, a data-driven integrated communications agency; and the public relations and communication company Padilla, which includes the brand consultancy Joe Smith, the food and nutrition experts at FoodMinds and the research authorities at SMS Research Advisors. In Europe, AVENIR GLOBAL owns the London-based strategic communications consultancy Madano and Hanover, one of the EMEA's leading strategic communications and public affairs consultancies, with offices in London, Brussels, Dublin, Dubai and Abu Dhabi. Hanover Group also includes creative communications agency The Playbook, and the brand and culture consultancy Multiple. The AVENIR GLOBAL network also includes healthcare specialists AXON Communications, with offices in Toronto, the U.S, the U.K. and Europe and healthcare creative agency Cherry, based in London. Hanover is one of Europe's leading strategic communications and public affairs consultancies, with offices in London, Brussels, Dublin, Dubai and Abu Dhabi. Hanover Group also includes creative communications agency The Playbook, and Multiple, a brand and culture consultancy that enables technology challengers and corporate change-makers to define their purpose, fire up their people and build platforms for growth.